That was one long hiatus. But I am back! So, puppet stuff. I went to watch War Horse (the play, not the movie) at the Ahmanson Theatre. It was one beautiful show. Really, I just bought the tickets because I believe that the puppets are going to be quite amazing (and they were), but I really liked the other aspects of the show as well, such as the design of the stage. Nowadays, there are a lot of shows that are going for more and more spectacular set pieces and props. This show, however, was very minimalistic with the set pieces. Many scenes just have people holding various sticks and they became fences, auction places, the farm, etc. It was actually quite effective. And to make it even more awesome, because we went with the Los Angeles Guild of Puppetry, there was actually a Q&A with the creative directors and puppeteers afterwards. The creative directors shared how the show came about, why there was a goose in the show, and how the differences in the venues (no revolving stage at Ahmanson) actually introduced new moves that worked even better. The puppeteers talked about how the teams were set up and how they all worked together to bring the horse to life. And man, these people are buff! “They are all in such good shape” was a thought I haven’t had since I was watching the Olympics. Anyway, the show is currently in Los Angeles, and will tour the United States. Do check out the excellent show if you have the chance. 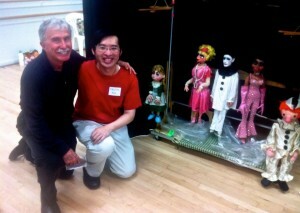 And here’s yet another awesome event from the guild: a marionette workshop! The workshop was taught by puppet master Tony Urbano, who had worked on many TV shows, movies and live performances. One aspect of these puppeteering workshops that I’ve always loved is the demonstrations. It’s always a pleasure to watch the masters perform up close. When I watched him show us how to do those moves, I just kept think this was the most awesome thing in the world, ever. After lunch, he took the people that had more marionette experience to the next room to practice mouth sync, while the rest of us continued our exercises. Yes, we spent many hours doing this with the puppet: walk across the stage, take a look at the bench (thinking about sitting down of course) and sit down. It was no easy task! 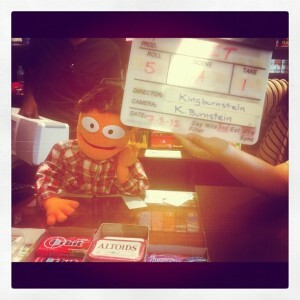 Have the puppet too high, then it didn’t look like it’s really walking. Have it too low, and it felt like it’s crouching. Also, if a limb swung out one way and the rest of the body didn’t compensate for that rotation, it just looked wrong. Tricky stuff, but surely a fun challenge. I really loved the final thought that he left us with (“the F word”). He told us to have Flair. Everybody has some kind of flair, but you got to find it, and bring it out. I really loved that. Too bad I wasn’t able to make it to the guild officer installment party where he did more performances. So why was I not able to make it? Because I was doing this other fun stuff. 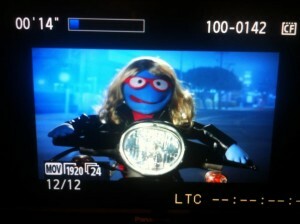 So I’ve been asked to help out on a music video that my friend’s friend is producing. I’ll talk about it later but let me just leave you with some pictures from the shoot. The video shoot looks really interesting and fun! I hope to see an update for it soon. 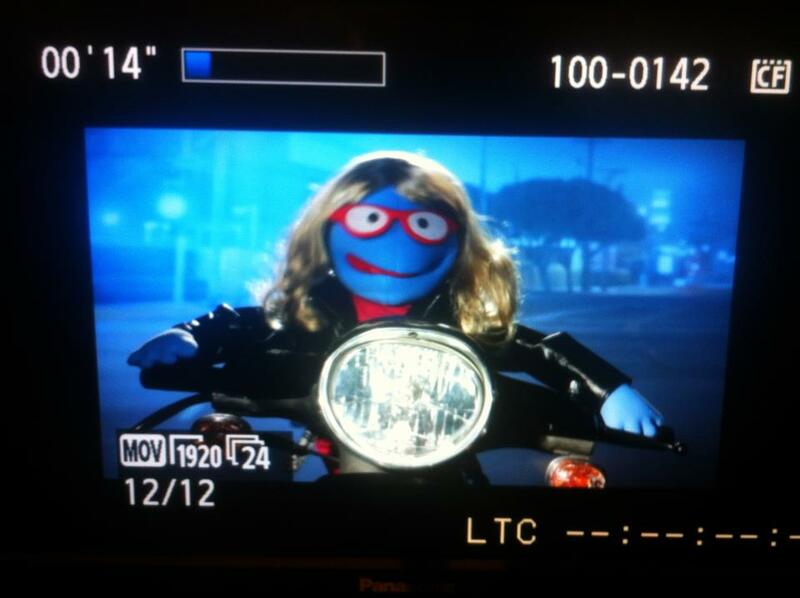 Hey, you’re back and talking about puppets. YEAH:~) I saw the movie, War Horse, but not the play. I can tell from the clips you showed, it must be fabulous. If it comes within traveling distance, I will definitely go see it. I didn’t get to see it in London; we couldn’t get tickets. I am so glad you are back sharing your puppetry experiences. I missed them very much. Good luck with music video. I hope we’ll see it soon! Sara recently posted..What’s freedom to you? Actually, the whole theatre thing (not just puppet theatre, although definitely more so with puppet theatre) has a huge element of suspension of disbelief. In a movie, you want everything to look realistic. For theatre, things can just be symbolic and it’s up to us to use our mind and imagination to fill in the blank, much like reading. However, the emotions are very real, and that’s the important thing. And thank you for your continual support, Sara! After a hiatus, some of the people that used to visit probably stopped checking, but not only that, many have stopped blogging altogether, which made your visit so much more precious. It never occurred to me that puppeteers would have to be in excellent shape before reading this, but I suppose given the fact that their arms are in constant motion and supporting puppets that can be heavy (particularly, I would think, in the case of Warhorse) that is needed. I love the puppet trying to choose between Orbitz and Altoids — I imagine the Altoids would be easier because they don’t require teeth. Haha, he’s actually the cashier so he doesn’t need to choose between Orbitz or Altoids. But nice product placement, maybe? I’ve seen many out of shape puppeteers (it’s not like I am in excellent shape myself), but for the more physically demanding roles, especially giant puppets, you definitely need to be in good shape. I’ve heard stories of many people suffering injuries doing the giant puppet in Little Shop of Horror. This is also where the proper weight balance in puppets is always appreciated by puppeteers, meaning, the puppet’s designed in such a way that gravity helps it do natural motions, instead of having the puppeteer struggle to make it look natural. Hey – nice to see you’re back! I’m not sure whether I want to see War Horse or not. I’m sure I’d enjoy the puppetry, but the thing has been hyped up so much and it’s not something I’d see other than out of curiousity. … Still, I’ve got some time before I decide. The Urbano workshop sounds like it was good – have you been reading Puptcrit? Found his comments there to be a bit off, but it’s interesting to see something controversial being discussed (if you have no idea what I’m talking about, please ignore). 😀 Yours looks like lots of fun, can’t wait to see it!! Well, there’s definitely a lot of hype. I personally just went because I wanted to see the puppets. I pretty much knew nothing about the story other than that there’s a boy, a horse, and a war. I vaguely remember hearing someone allude to that. Might have been you? I haven’t been reading Puptcrit.